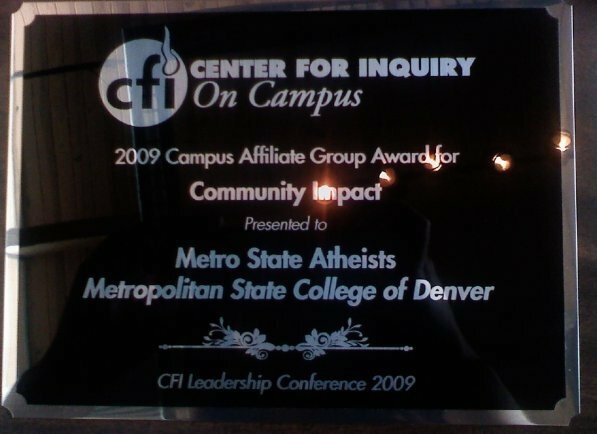 Metro State Atheists has just been awarded the 2009 Campus Affiliate Group Award for Community Impact by the Center For Inquiry. Many things happen during a college semester: mid-terms, finals, work and…activism? Yes, activism! That is the case for us, Metro State Atheists (MSA), an affiliate of the Center for Inquiry. Besides the classes, work, and other academic responsibilities that we endure, we participated in some secular activist activity that put me in the spotlight both locally and nationally. Not many can argue that 2008 wasn’t a historic election, not only for the entire country, but also for Colorado as we hosted the 2008 Democratic National Convention. However, that wasn’t the only history being made—at least trying to be made—in Colorado. Amendment 48, or the Personhood Amendment, was on its way to become the first legislation in the United States to not only completely ban abortion but also redefine the term “person”: “to include any human being from the moment of fertilization.” When our group became aware of this initiative early in the summer, we immediately knew that we had to do all we could to prevent this from passing. That is just what we did, come the fall. We contacted the political group “Protect Families Protect Choice,” to offer our support, and they responded by giving us informational material as well as yard signs, stickers, etc. We then had two informational tables set up two weeks out from the election urging people to vote no on Amendment 48. This caught the eye of our local news, Channel 9, which was in the process of doing stories on the different amendments on the Colorado ballot. They asked to interview me about Amendment 48 the next day on campus as a part of their series that aired live online. Come November 4th, Amendment 48 failed miserably, much to our pleasure. We’d like to think we had a hand it its demise, seeing as we worked quite hard on campus to that end. Next, without much warning, came what would turn out to be the most media coverage we have ever received. MSA is a part of the Colorado Coalition of Reason, or COCORE, which put up 11 billboards in the Denver metro area and Colorado Springs. The message was similar to those seen elsewhere around the country. The billboards needed only eight words, “Don’t believe in God? You are not alone,” to ignite a controversy that took two local newscasts (11/13/08, 11/18/08) and a half-page opinion article in the Rocky Mountain News to clear up. The fervently religious were utterly offended that such a message was allowed in Denver. The story received national media attention when the Channel 7 news story made its way onto CNN.com. We saw our first hate mail ever, from Christians no less, calling us evil and full of hate. I got phone calls too! However, instead of being mean-spirited phone calls, they were supportive. A man from South Carolina called me, telling me that he appreciates what we are doing and asked me, as a fellow atheist, if there were any similar organizations such as MSA or COCORE in his area. Another call was from a Jew lending his support to the cause. This project was a great learning experience and we enjoyed the huge amount of media coverage it got. It made more of an impact that we could have hoped for in our wildest dreams. The last and most recent event wasn’t really an event, so to speak. After rediscovering my cousin Becky via Facebook, I learned that her pastor is Bob Enyart who appeared on the same newscast as I regarding the aforementioned billboards. She told me that ever since she told Bob that I was her cousin, he has been wanting to have me on his show on 670 AM, KGOV. She then served as a go-between to make the proper arrangements for me to be on the show. In short order we arranged a date and time. I appeared on Bob Enyart Live on January 7th, 2009. We talked about atheism, the billboards, and about how I became an atheist. This was an advantageous interview as Bob has offered to advertise our events to people of an opposing viewpoint, which we believe is critical to our cause. In closing, I’d like to stress the importance of organizing. Although the task of secular activism and attempting to effect change can be tough, and at times seem impossible, it can be done, even if it’s just change at the local level. Think big, but take baby steps. The American Revolution wasn’t born, fought, and won in a day. We need to stay vigilant, learning from every victory and, perhaps more importantly, from every defeat. When a minority is fighting a majority who commands all the power and resources, it amplifies the importance of cohesive, organized goal-oriented activism by many orders of magnitude. Gandhi said, “Be the change you want to see in the world.” I believe this is insufficient and passive. You must not only be the change but also be willing to work for it. Thus, I appeal to you all: work with us, fight hard, and we can bring about the change necessary to make this country what it once was! 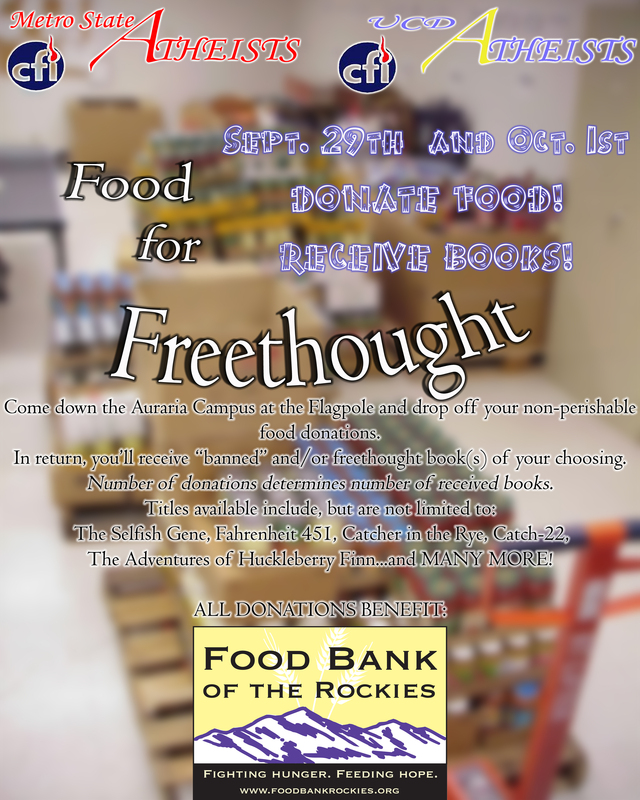 Joel Guttormson is President of Metro State Atheists and a theoretical mathematics major, linguistics minor at Metropolitan State College of Denver. Joel also volunteers for CFI as a campus regional coordinator.